As part of the 2010-2011 music and dance season, the Music Academy Madras ran an interesting lecture series every morning during the second half of December. On December 21st, renowned Bharata Natyam dancer and scholar, Dr Padma Subrahmanyam, presented a one-hour talk on the karana sculptures of the Brihadeeshwara Temple in Thanjavur (Tanjore). 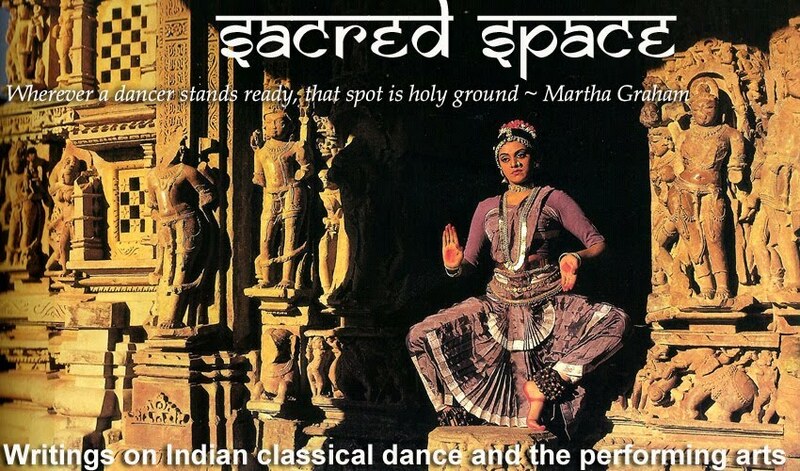 It was on that day that her fascination for this temple took root and what followed was years of active and intense research which resulted in a PhD degree and a book on the karanas in Indian dance and sculpture. Construction of the Brihadeeshwara Temple started in 1003 and was completed in 1010. Dr Subrahmanyam emphasised that it is not only an important historical monument but also an immensely significant cultural one. King Rajaraja Chola had made the temple an important centre for music and dance, and there are detailed records existing on its cultural administration. The original name of this temple complex was Rajarajeshwaram. Last year the temple commemorated its 1000-year anniversary. To celebrate this occasion, 1000 Bharata Natyam dancers performed at the temple on September 25th, 2010. The focus of Dr Subrahmanyam’s lecture was on the karana sculptures which are found in passageways located on an upper level just above the sanctum of the temple. They were discovered in the year 1956 – a significant year, as it was the same year, she revealed, that she presented her arangetram, or debut solo performance. She described this as a ‘divine ordination’, as if it was god’s wish for her to study the karanas. It was an employee of the Archaeological Survey of India (ASI) who discovered a hidden passageway while removing weeds. This passage led to the long forgotten sculptures. 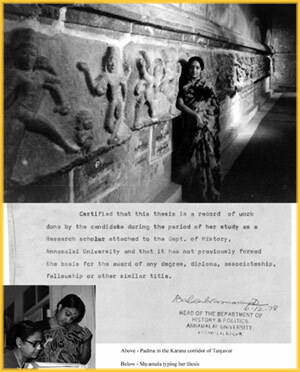 Dr TN Ramachandran (director general of the ASI) identified them as sculptural depictions of the karanas. It took months to clear away all the debris and completely uncover the sculptures. These sculptures are the oldest attempt at creating sculptural depictions of the karanas. 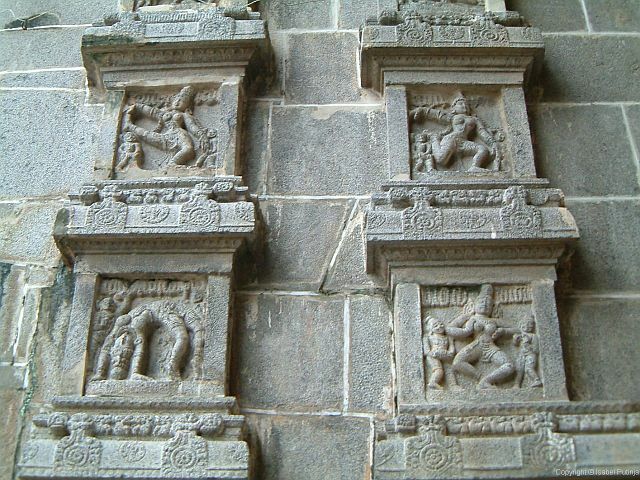 These are figures of lord Shiva demonstrating the 108 karanas as described in the 4th chapter of the Natya Shastra, the ancient treatise on the Indian performing arts. However, here in Brihadeeshwara temple, there are only 81 sculptures and many empty slabs. The work was never completed. Dr Subrahmanyam explained that the karanas are not poses (as was previously believed) but movements. 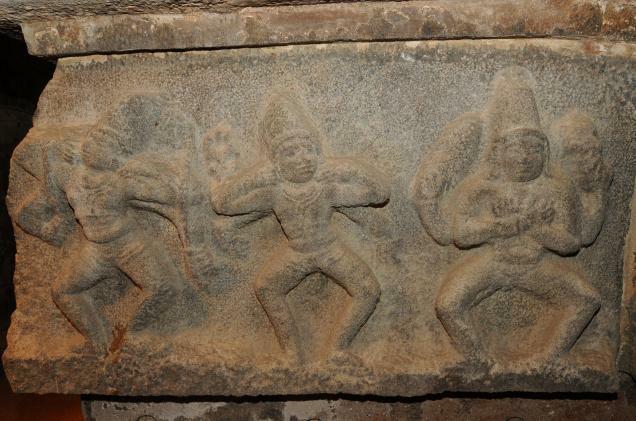 The sculptures are like still photographs of a dancer performing the karanas. The sculptor portrayed a different aspect of the same movement. Each figure has four arms: Dr Subrahmanyam believes that the secondary arms show the course of the movement of each karana. Unfortunately the part of the Brihadeeshwara temple where the karana sculptures are located is not open to the public. But this is not the only place where karana sculptures are found. They can be seen on the temple gopurams (entrance towers) of Chidambaram temple and at Saranagapani temple in Kumbakonam. Interestingly, there are also karana sculptures at the temple complex at Prambanam in Cental Java, Indonesia dating back to the 9th century. Learning the karana movments is part of every dance student’s syllabus. Dr Padma Subrahmanyam has made a tremendous contribution to the dance world by studying all the sources describing the karanas and reconstructing and documenting them. During her presentation at the Madras Music Academy, her 14-year-old grand-niece demonstrated some of the karanas. Excerpts of Dr Subrahmanyam’s television series on the karanas were also screened. Dr Padma Subrahmanyam's work on karanas is very valuable. I very much enjoyed watching her Karana Prakaranam DVD and the serial on Natya Shastra on Dancingindia.net . Learning the karana movments was part of every dance student’s syllabus, and should be today also. Is it possible to learn the karanas from the DVD? I would very much like to learn it. Thanks for this post. Very valuable.